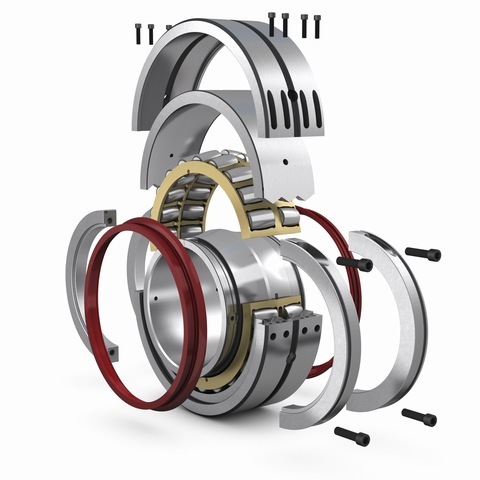 Cooper split bearings are the ideal solution for reduction of machinery maintenance/repair downtimes whether planned or through failure of the original bearing. The advantages of the Cooper split bearing solution are especially valuable in inaccessible or trapped locations e.g between head pulley and gearbox or motor, where the need to dismount associated equipment is eliminated. Split to the shaft bearings disassemble into smaller components easing the tasks of lifting and handling and making assembly or changeout simple even in the most cramped and inaccessible conditions Clearances are pre-set, so no on-site adjustment is needed and no specialist fitting tools are required. Increased Load Ratings Longer operational life with higher safety margins. Self Locking Steel Cage Increased operating temperature range. Lower maintenance costs with simple assembly. No small components to remove, replace or lose. 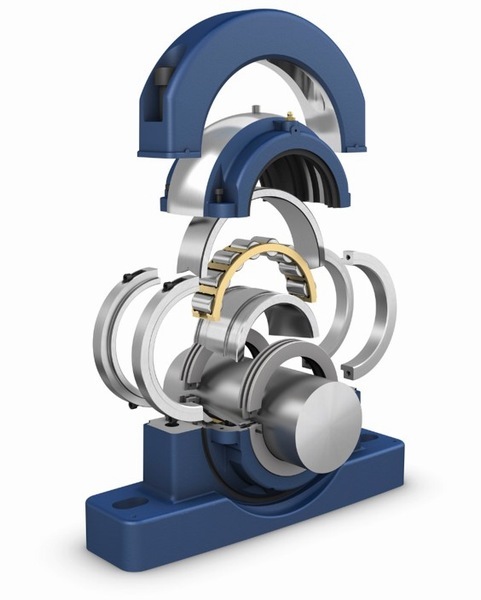 Split to the Shaft Bearing Installed without moving adjacent equipment or machinery. Low cost of installation. Ease of replacement. Reduces downtime. Increases maintenance efficiency. Comprehensive Range of Mountings Meets most application requirements from the standard range. Pedestals available in steel, grey iron and nodular iron including: flanges, rod end bearings, take-up bearings and custom bearings. Superior Concentric to the Shaft Sealing Reduces contamination.Retains lubrication.Prolongs bearing life.Proven range of sealing options. In the case of one long term Cooper customer: a heavy duty clinker breaker application in the cement industry utilising solid bearings was undergoing bearing replacement every six months, each changeout took 32 man hours with the downtime at 16 hours. 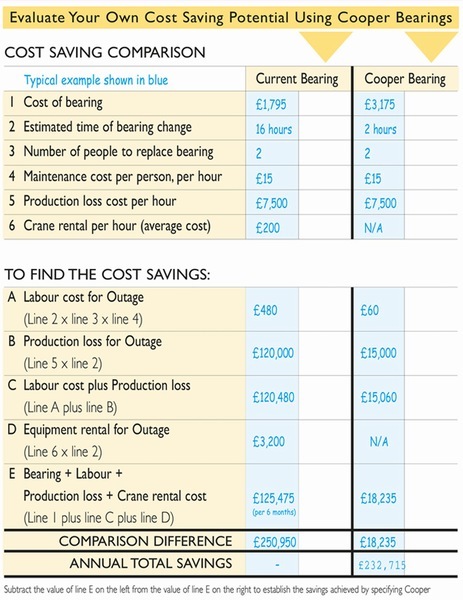 Production loss was quoted at £7,500 per hour, this alone totalled a production loss cost to the customer of £120,000 per bearing changeout. The total cost per year for this customer was £250,950. The bearings were then replaced with Cooper 03 BCP 180mm GR bearings and installation time plummeted to four hours. 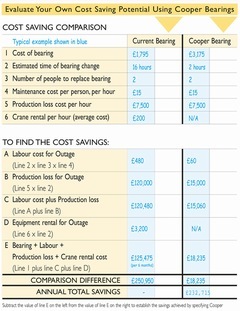 Production time increased and production loss costs reduced to £15,000. The result was an instant saving of £107,240. with the superior concentric sealing and the quality of the Cooper product. 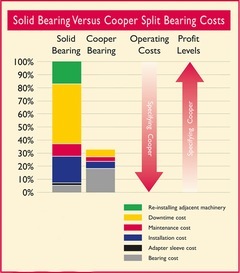 even in the toughest operating conditions, a Cooper split roller bearing is a guaranteed return on investment.